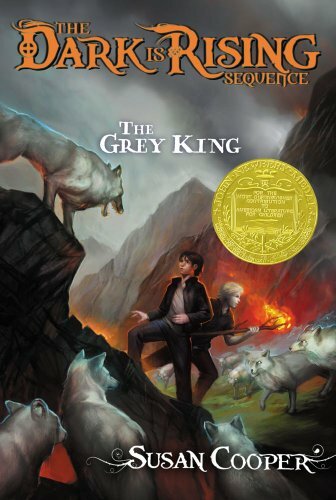 Reading down my list of Newbery Medal winners, I liked the sound of The Grey King by Susan Cooper. If I had realized it was part (Book Four) of her Dark Is Rising series, I might not have. However, by the time I realized that I had the audiobook sitting in my car and nothing else to listen to, so away we went. And it wasn’t terrible. But I wouldn’t have given it any awards either. I’d read The Dark Is Rising (which, oddly, is Book Two…) and I didn’t like it much. I didn’t hate it, but I found the conflict strangely dull and the climax totally flat. Which is kind of how The Grey King turned out too. I looked up plots of all the books, to make sure I actually could start in on Book Four, and I think I pretty much could…so in a way this was a lucky mistake, since I didn’t waste time on the others. The book centers around Will Stanton, age 11 but also the youngest of the Old Ones, ancient magical beings locked in a struggle between the Light and the Dark. The Grey King opens with Will recovering from a serious illness, and so sent off to his uncle’s farm in Wales to recover. There, he realizes he is entering the territory of the Grey King, a powerful figure of the Dark. With the help of Bran, a local boy who may have his own mythical connections, Will goes on a quest to wake the Sleepers, fighting the Grey King and his pawn, bad-tempered farmer Caradog Pritchard. I loved just one thing about this book, and that was, strangely enough, the setting. I seem to have a thing for Welsh settings. It’s rugged and wild and mysterious and that part was excellent. It also may have helped that I listened to this on audiobook, so I got to hear some great Welsh accents. I was actually very impressed by Richard Mitchley as the reader. Besides the accents, I think he occasionally brought more drama than was inherent in the words, and was especially good on some of the more frothing, furious lines of dialogue. So why didn’t I like the rest of it? Will was just not very interesting as a character. He felt too much like an ancient Old One and not enough like an 11 year old boy—and the inherent conflict of being both those things was pretty much nonexistent. The Dark felt far too ephemeral and vague as an enemy. There’s a lot of “malevolent forces” and not so much on tangible enemies. The tangible ones that exist are rarely fought head-on. The Grey King himself acts mostly through Caradog Pritchard—who is not a half-bad villain in his own right, hostile and belligerent and prone to ranting. He might have made a perfectly good villain…if he didn’t seem like a minor one compared to the Grey King, who…never really confronts Will at all. I finally realized there was not going to be a confrontation with the Grey King right in the middle of what turned out to be the climax, and it was all rather disappointing. And those Sleepers Will has to wake? Well (spoilers), that happens, and seems like a total non-thing. They ride off to help the Light and have pretty much no impact on the story. So…clearly someone likes this book a lot. It won a Newbery Medal, for heaven’s sake. But I’m not a fan!